A radical Muslim sheikh called Friday for the creation of an Islamic Emirate in Gaza, sparking clashes with Hamas forces that have left at least six people dead, Hamas sources told CNN. The clashes are the latest between Gaza’s Hamas rulers, who have said they are moderate Muslims pledged to the Palestinian cause, and more radical Islamic groups. The gunfight erupted near the mosque in the southern Gaza city of Rafah, where the cleric delivered his sermon, the sources said. Hamas militants raided the mosque and seized control of it. Later, the fighting spread to the house of the sheikh who delivered the sermon on Friday, the sources said. So far, the fighting has left six dead and 25 others wounded, the sources said. Israeli media identified the cleric as known to his followers by nom de guerre Abu al-Nour al-Maqdessi. 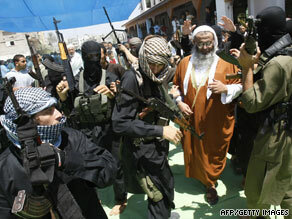 The Jerusalem Post reported al-Maqdessi announced the birth of “an Islamic Emirate” following theocratic rule. There are concerns that the fighting may spread to other cities across Gaza. The gunfight involves fighters loyal to Salafist jihadist groups, including Jund Ansar Allah and Jaljalat, which are described as al Qaeda-inspired and which seek to set up strict Islamic law in Gaza. The groups have clashed in the past with Gaza’s Hamas rulers.